Here Is How a Grocery Store Displays Bags of Chips! Grocery Chip Display is configured from Madix Gondola Shelving in either a single sided pr double sided island shelving system with either a wire chip shelf or a standard Madix upper shelf using a front fence to hold the bags of chips onto the shelf. 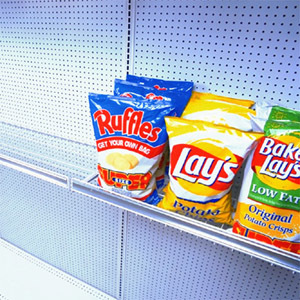 Both the Wire chip shelf or the standard upper shelf with a fence will hold the bags of chips on the shelf.